Both my boys are interested in cars, especially sports cars. You know, they want to be a famous footballer one day, so they have to brush up on their sports car knowledge just in case. I got my husband Robert a sports car day for his birthday last year and he got to drive a Ferrari, so they have been very popular with them since. 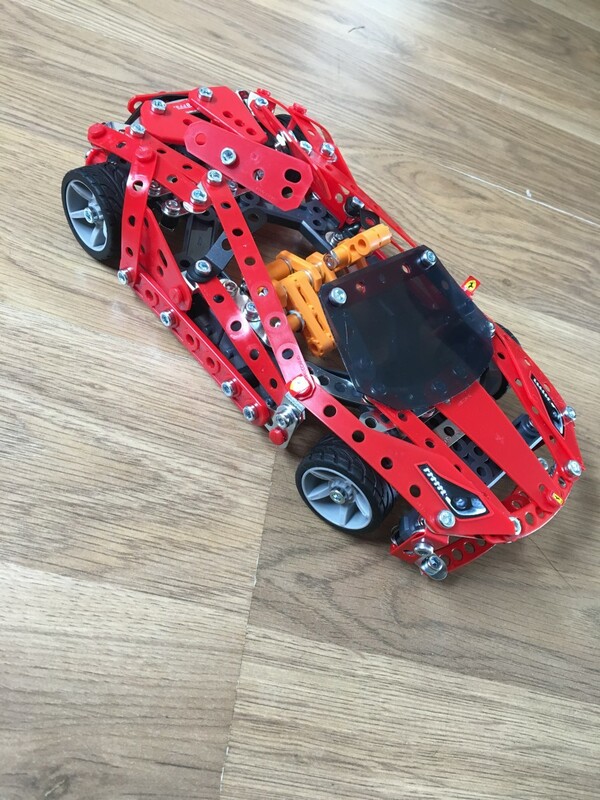 They have various different models, so when the Meccano Ferrari 488 Spider came my oldest Lucas couldn’t wait to build. To be honest, this turned out to be something that my 10 year old couldn’t do on his own. It is quite complex and at times it is best to have two people, one to hold and one to out the nuts and bolts in. It is a fantastic project for some one on one family bonding time. We built this together. It wasn’t easy and challenging at times. But, with some patience, this project is rewarding and looks amazing when built. I’d recommend this for an older child or a mature 10+ year old who enjoys these types of things. 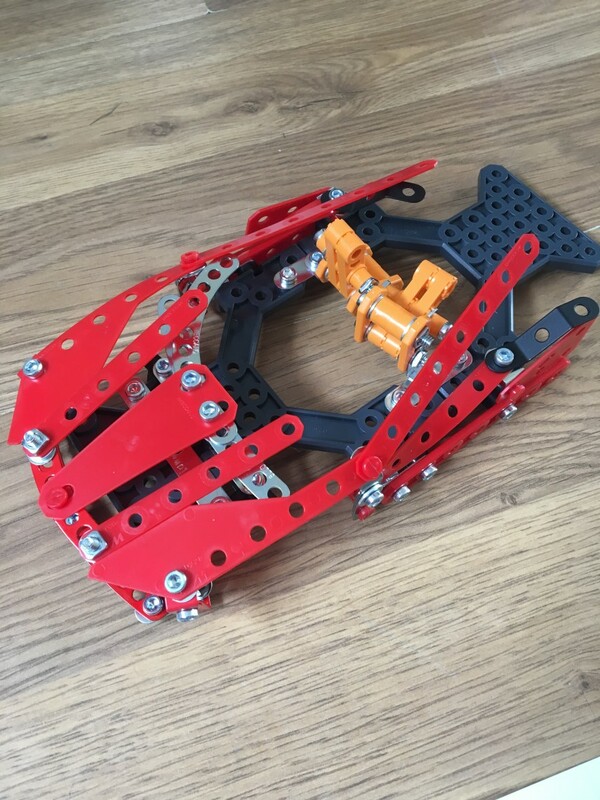 I loved Meccano as a child and building model aeroplanes with my dad, so this was right up my street. We had a lot of fun building. Within the kit you will find everything you need to get this little car built. Lots of bits, nuts and bolts, stickers, screwdriver similar item for screwing in the bolts and a spanner type item for attaching the nuts. The instructions are simple and straightforward by using step by step via picture diagrams. 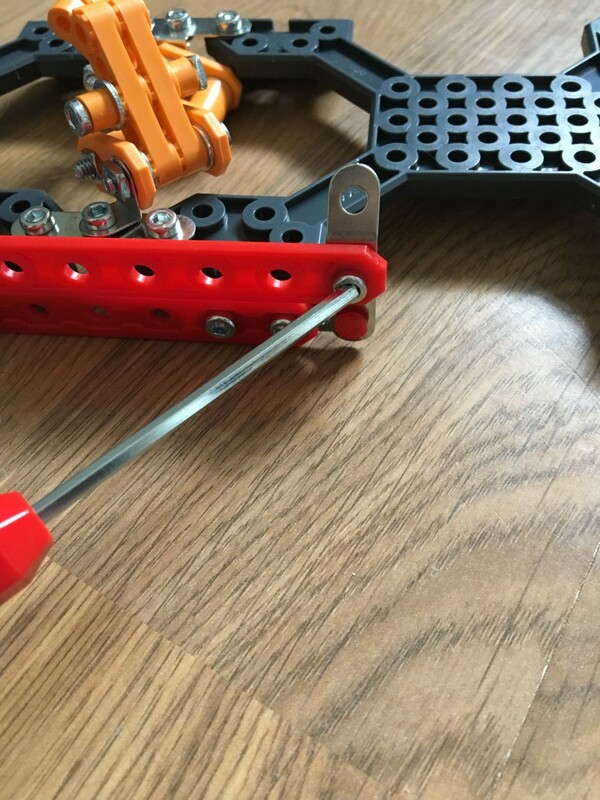 As with meccano there are some great pictures for the type of screws you need to use. You put the screw over the picture to check the size and look. No more using the wrong one and only finding out when you are 3/4 of the way in. The instructions are easy to follow and I’d suggest you map out a chunk of time to do this and separate the parts into bundles. It will make things a lot easier in the long run. 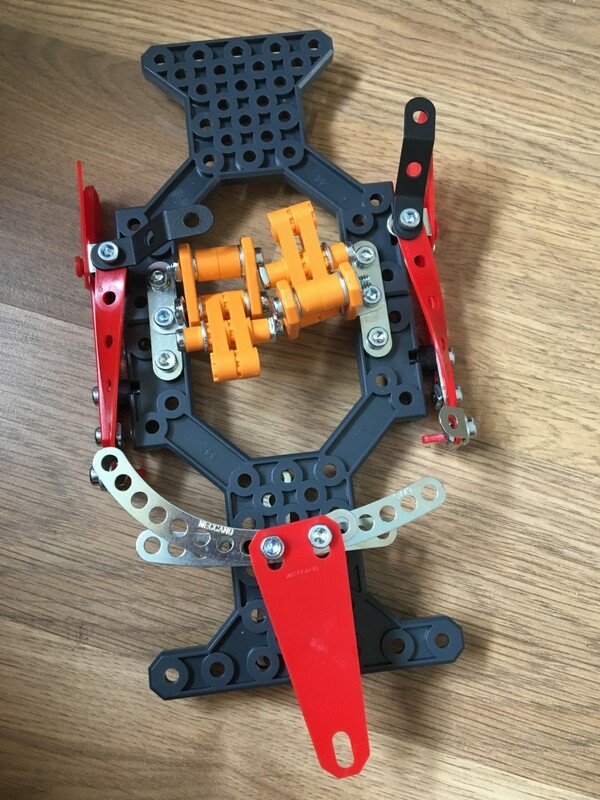 We discovered a missing part and contacted Meccano via the link on the instructions. It took seconds and the part arrived within 3 weeks. Excellent customer service. Once the part arrived we got stuck in and started to build. The screwdriver and spanner were a lot of fun, but it does take patience and perseverance. 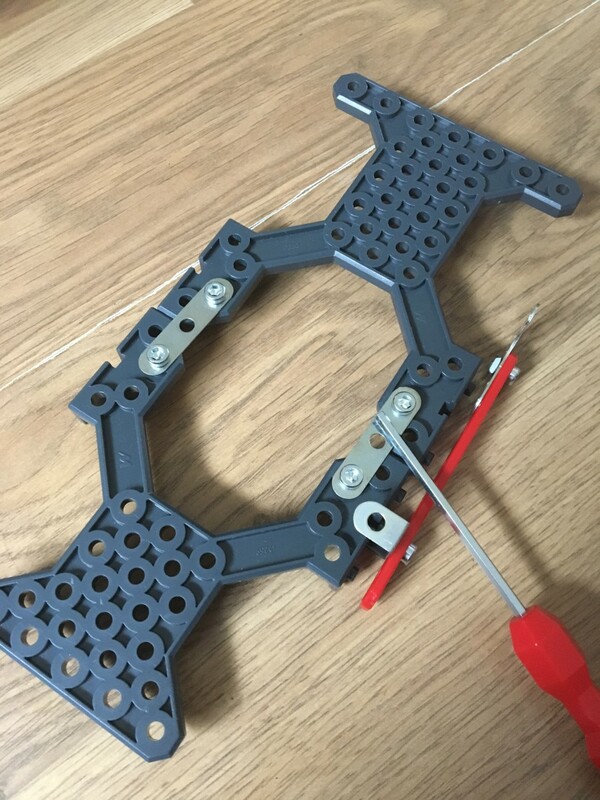 You can see what I mean about the instructions and how it shows where the screws should go and the size is laid out there for you. The instructions were to follow, but it was a little tricky for my oldest. Once we got into the swing of setting it up, we were on a roll and with the base all together, it was starting to look pretty cool. You can see it all coming together. It is a really lovely model with a gorgeous design and sleek outer body. The crosshatch floor makes it look the part too. The vibrant ferrari red, really pops against the grey and black interior. I think building the top part of the vehicle was simpler and not as fiddly as the underneath components. Plus, not it’s starting to take shape, Lucas got a bit more interested in building it. 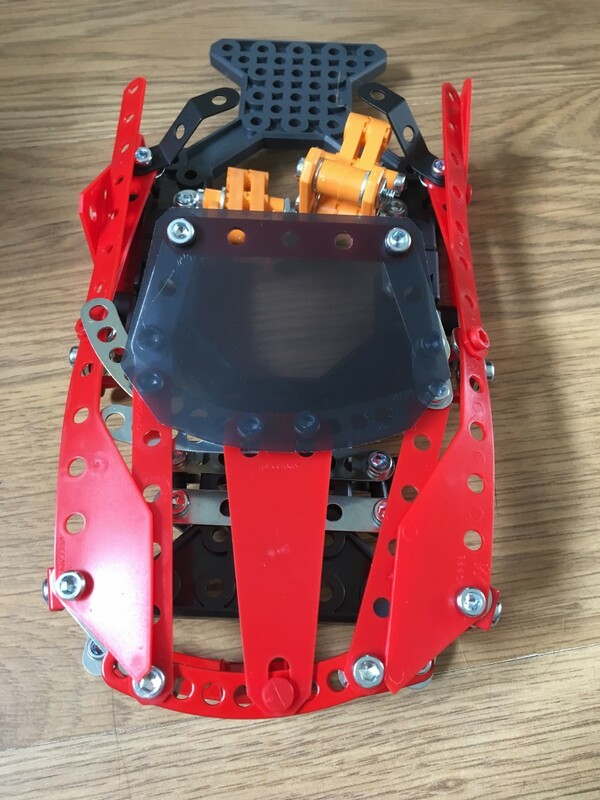 There are parts that are quite complex to follow and younger kids will definitely lose interest, unless they are into building this type of toy. It really depends on the child. The car is really taking shape, before we add the wheels and the Ferrari stickers which really is the icing on the cake. Tadah! Pretty cool huh? Ok, it’s not quite perfect, but we love it and both Lucas and I were so proud we got it finished and it looked the same at the one on the box. There were a few touch and go moments. 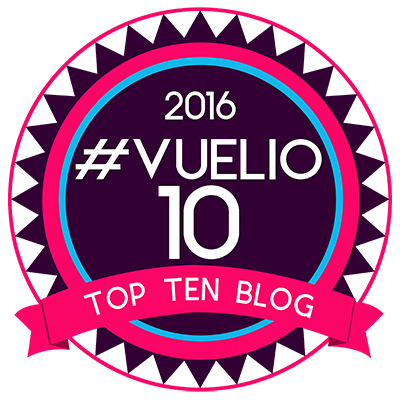 But look at it, what an achievement. Lucas was so proud of it, he gave it to his Grandpa for father’s day. How sweet is that? The attention to detail is fantastic, right down to the teeny number plate at the back and the Ferrari logo at the front. The wheels turn and you can drive the car about. It’s not one to be played with roughly or for little kids as it’s not as sturdy, but it looks great and has it’s pride of place on the shelf for all to admire our handy work. 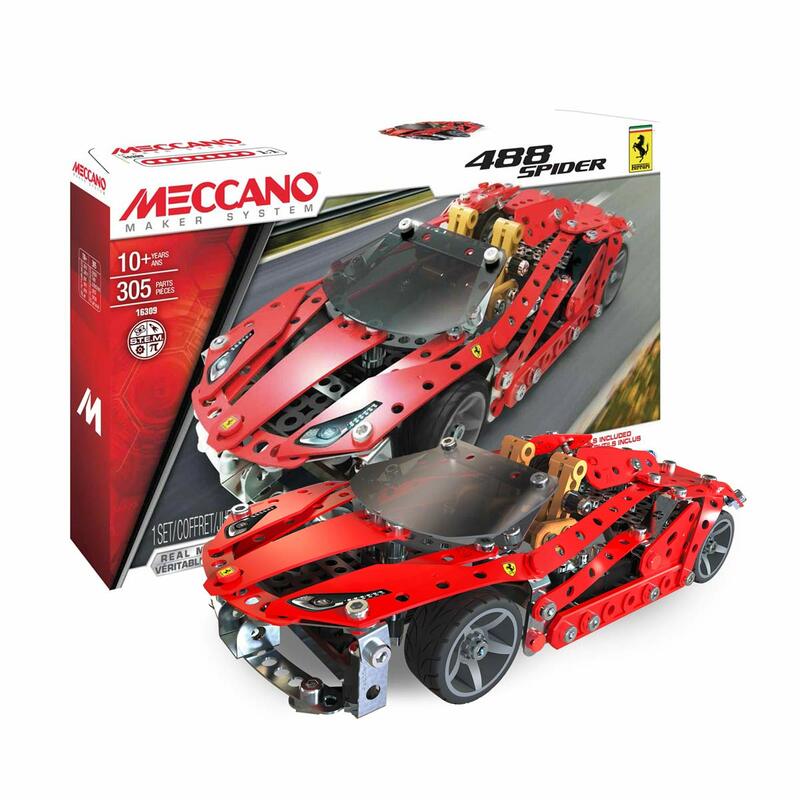 The Meccano Ferrari 488 Spider is suitable for kids and adults aged 10+. I would recommend for older kids if they want to build on their own. Or it’s a fantastic kit to built with you kid on a Sunday afternoon. There are a few tricky bits, but together you can work it out. We had a lot of fun building this together, but my 10 year old wouldn’t have been able to do it on his own. 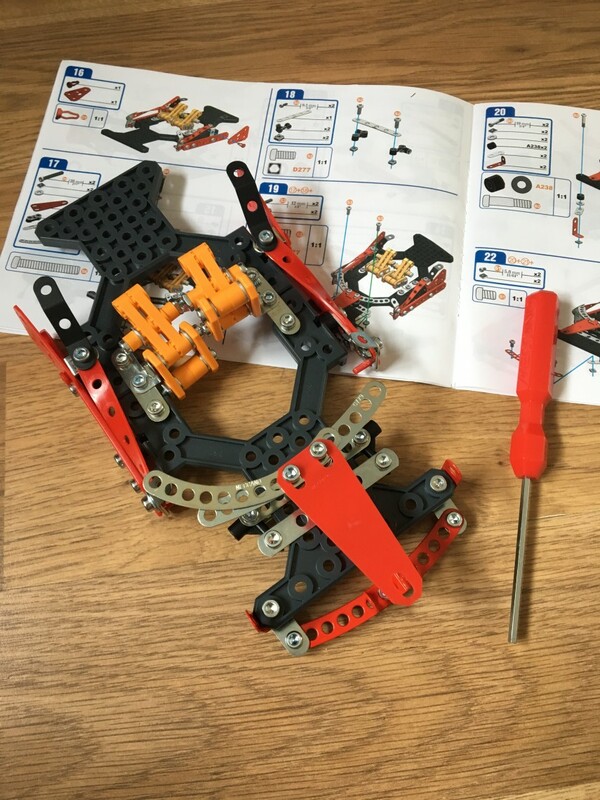 The parts are well made and the construction kit comes with everything you need. With an RRP of £29.99 I think this is great value for money. It isn’t a toy that can be played with, but one that will be a challenge and a great sense of achievement once done. Any car enthusiast would love this as a gift too, it’s one that is not just for the kids. 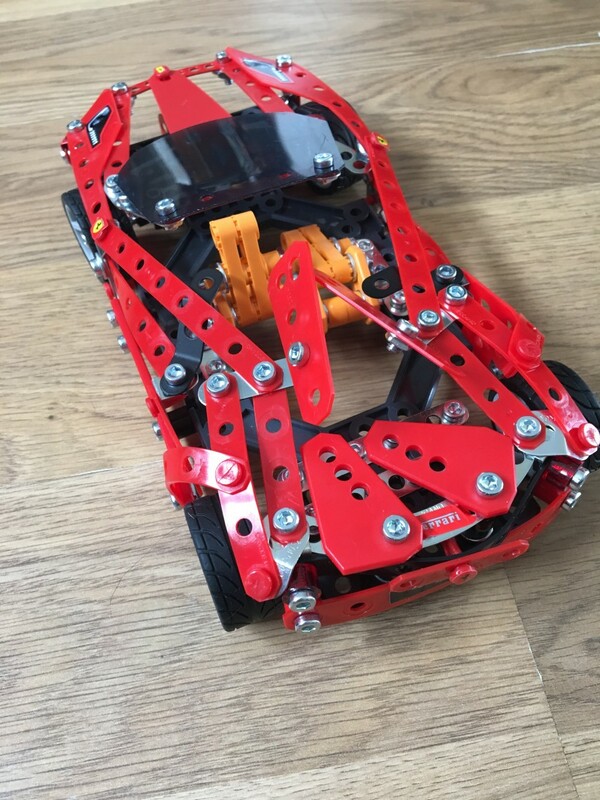 You can find out about all of the Meccano models, order replacement parts and more at the Meccano website. 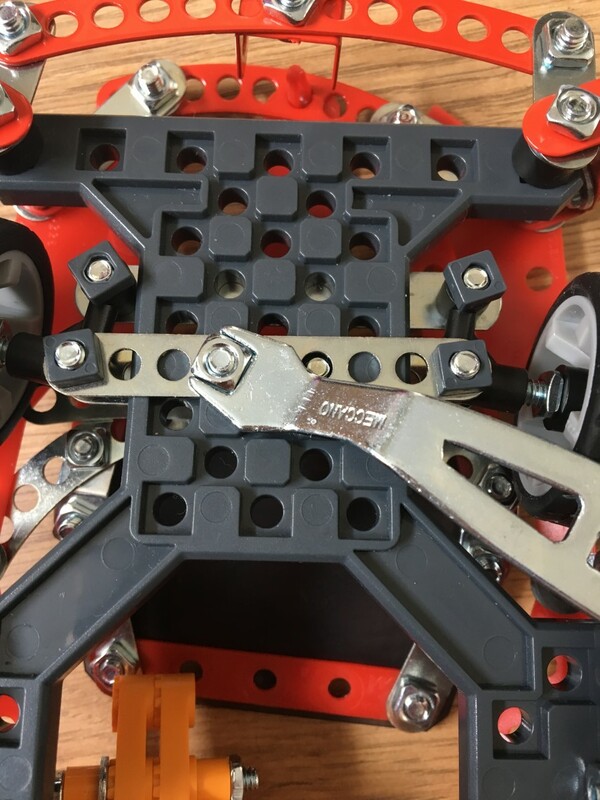 We have also reviewed the Meccano Robot Switch if you’d like to see how we got on with that also. And a Sonic The Hedgehog kit too. 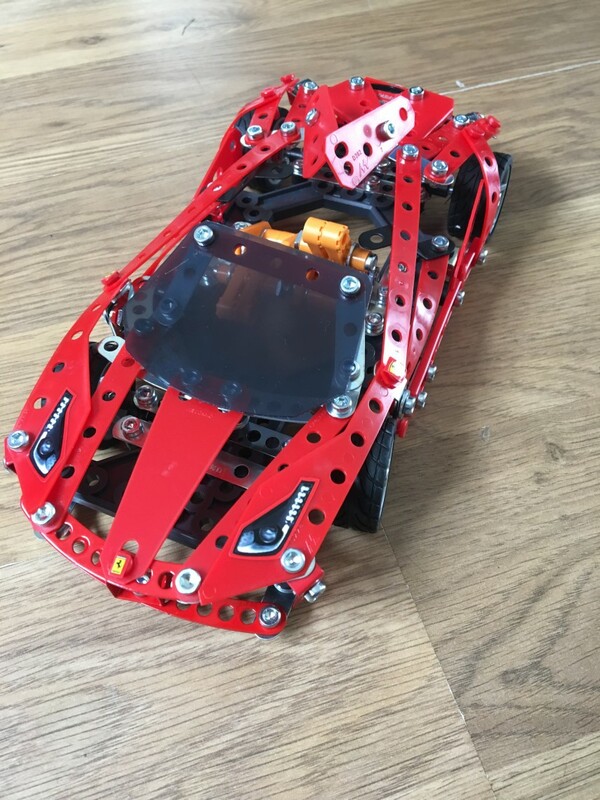 Disclaimer:- We were sent our Meccano Ferrari Model Kit for review, but all words and opinions are my own.